Wow! Talk about a landscape that is spectacular and a great place for taking a hike… it is the Anti Atlas Mountains. The climate is very temperate and here is your chance to immerse yourself into Berber culture. The Anti Atlas is off the beaten path, as it takes you away from the hustle and bustle of popular destinations in Morocco, such as Marrakech. The Anti Atlas mountain range runs south for about 300 km, along the Atlantic Coast and into Ouarzazate where it borders the Sahara. If you are visiting during the months of January and February, you will be there in time for the almond trees blossoms that cover the hillsides with its beautiful pink flowers. The beautiful rock formations, such as Napoleon’s Hat and Lion’s Head and prehistoric rock carvings. The Berber castles called agadirs sit atop the rocky outcrops in places such as the road north of Tafraoute and the Assif n’Mougene canyon in the southwest of the mountain range. The beautiful volcanic range of Jebel Siroua (Sirwa) is a great place for trekking and hiking. Some of the more beautiful towns in the region include Taroundant, a lovely Berber town that has one of the best markets. 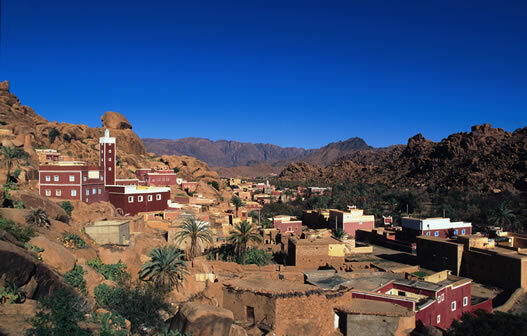 Traveling from Agadir, you can take a nice 3 hours drive into Tafraoute, which is a quiet town into the mountains. Lastly, but by far not least, is Taliouine, a small village that is at the edge of the Jebel Siroua (Sirwa); this village is midway between Taroudant and Ouarzazate. Great place to stop to purchase spices. When you are traveling in Morocco, let Morocco Why Not take you to these fantastic towns as you travel through the wonderful Anti Atlas.